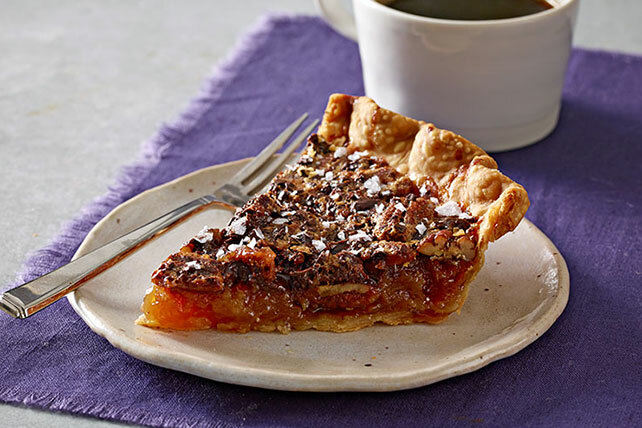 Allow sea salt to bring the element of surprise to this chocolate-studded pecan pie. Salted-Chocolate Pecan Pie is the best of everything a dessert should be in one pie shell: sweet, salty, chocolatey. Serve this Salted-Chocolate Pecan Pie in addition to your favorite pecan pie for absolute balance. Unroll pie crust; sprinkle with half the flour. Turn; sprinkle with remaining flour. Press firmly onto bottom and up side of 9-inch pie plate; flute edge. Whisk next 5 ingredients until blended. Stir in nuts; pour into crust. Sprinkle with chocolate. Bake 15 min. Reduce oven temperature to 350ºF. Continue baking 30 to 35 min. or until top is puffed and lightly browned. Cool completely, sprinkling with salt after 15 min. This classic pie, made unique with its salted chocolate topping, can be enjoyed on occasion. Prepare using 1 frozen deep-dish pie crust (9 inch).